Photonic crystals are dielectric structures which have bandgaps that prevent certain frequencies of light from passing through them. For this reason we investigated them as the third technical application in Component One. 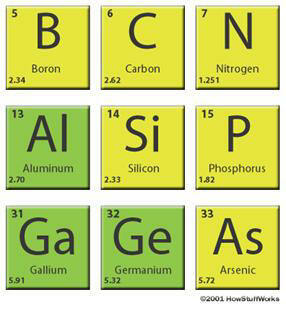 Photonic crystals can be made of silicon or the elements surrounding it on the periodic table, as shown in this diagram. The structure of photonic crystals is like that of graphite, although the material itself is not restricted to graphite. The crystals are arranged in a hexagonal lattice, as shown in Fig. 1 below. 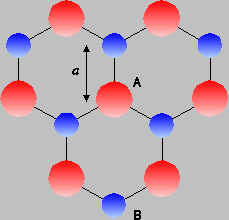 The red circles (defined as A) represent Arsenic (As) atoms, and the blue circles (defined as B) represent Gallium (Ga) atoms, thus forming the graphite (GaAs) lattice structure. When A sites are occupied by cylinders, a triangular structure is formed. When B sites are occupied by cylinders of the same type, a graphite structure is obtained. Essentially, the structure is stretched along an axis into the page to create cylinders, as shown in Fig. 2 below. 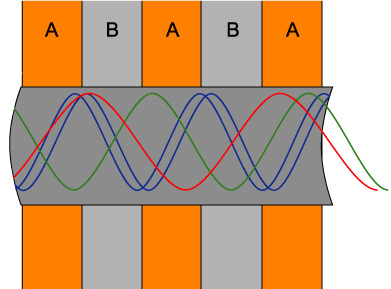 The concept of photonic bandgaps was first introduced in 1987. An array of 1-mm holes were drilled into a slab of material of high refractive index (3.6). The material, Yablonovite, named after the scientist performing the experiment, Eli Yablonovitch, was found to prevent microwaves from propagating in any direction. This experiment used a one dimensional photonic crystal, which limited light to travel in one direction, as in Fig. 2 above. The first way to use photonic crystals is to place them laterally along the length of a surface with the circumference of the holes perpendicular to the surface, as shown in Fig. 3 below. Light enters the grating perpendicular to the cylinders, the space between the cylinders limiting a certain range of wavelengths from passing through. This is the concept of a one-dimensional photonic crystal, since the light enters in one direction (perpendicular to the cylinders or into the page) and leaves in one direction (behind the cylinders). Fig. 3 Below is an example of a one-dimensional photonic crystal. The process is similar to Fig. 4: Bright light enters perpendicular to the cylinders from the front. 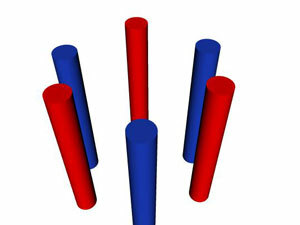 The contrast between the two dielectric materials (red and blue cylinders) offsets the blue wavelengths of white light slightly out of phase, similar to Fig. 4. 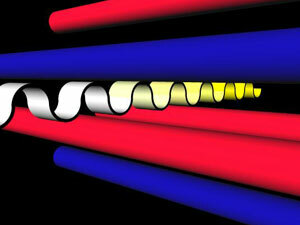 The constructive interference of the two blue light waves creates a region of forbidden wavelengths, called a bandgap. This allows green and red light through to create yellow light, which is less intense to the human eye, as shown below. Image courtesy of Sean B. However, photonic crystals can also be used in a much different way. A film of photonic crystals can be made by alternating sheets of different dielectric materials into a stack. Holes are milled through the stack in a hexagonal pattern to create the photonic crystal sheet. A light wave will pass through different mediums when it travels through the hole, as shown in Fig. 4 below (a cross section of a photonic crystal viewed from the side). This is a two-dimensional photonic crystal in a sense that light travels through the hole, as in Fig. 4, rather than through a group of cylinders, as in the diagram above. This allows light to enter the hole at an angle, rather be restricted to a single direction (one dimension), perpendicular to cylinders. The reason dielectric material is used to make photonic crystals is that a dielectric has the property to modify a light wave's periodic nature, mainly the amplitude, phase, and frequency. When two light waves propagate through a photonic crystal, one light wave is slightly displaced due to the dielectric's property to modify the phase of a light wave. The two light waves, slightly out-of-phase, constructively interfere to create a region of forbidden frequencies, or a gap. Any other frequency, however, is allowed to pass through. This, succinctly, is the concept of a bandgap. 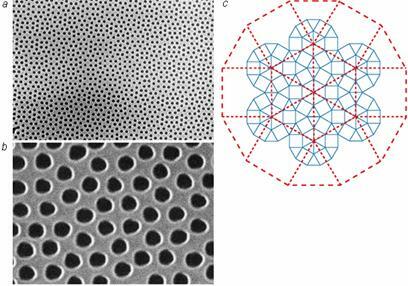 Image courtesy of Daniel W.
The difference between the photonic crystals in Fig. 3 and Fig. 4 is that the crystals in Fig. 3 have little to no dielectric material between the holes, thus forming cylinders in empty space rather than holes in solid dielectric material. When Fig. 4, photonic crystals are viewed from the top, the view is as shown in Fig. 5 below. Note the symmetry of C; the lattice is symmetrical, and thus uniform over the entire sheet. The size of the cylinders (photonic crystals) in Fig. 2 is on the order of microns. For the purpose of an application, each graphite cylinder has a diameter of 0.24 microns. This length is larger than 0.9 microns, which is the absolute bandgap of the near infrared spectrum. Thus, the graphite cylinders have the ability to prevent the propagation of infrared light, while allowing light of other wavelengths to pass through. Additionally, the diameter of the graphite cylinders is large enough not to require the etching of thin dielectric walls, thus allowing light of other wave lengths to have full intensity. These crystals can be used in conjunction with other crystals to block out many different frequencies. The crystals allow all but the unwanted energy to pass through them. When the photonic crystal sheet in Fig. 4 is stacked, the ending result is a photonic crystal film ready for application, as shown in the picture below.